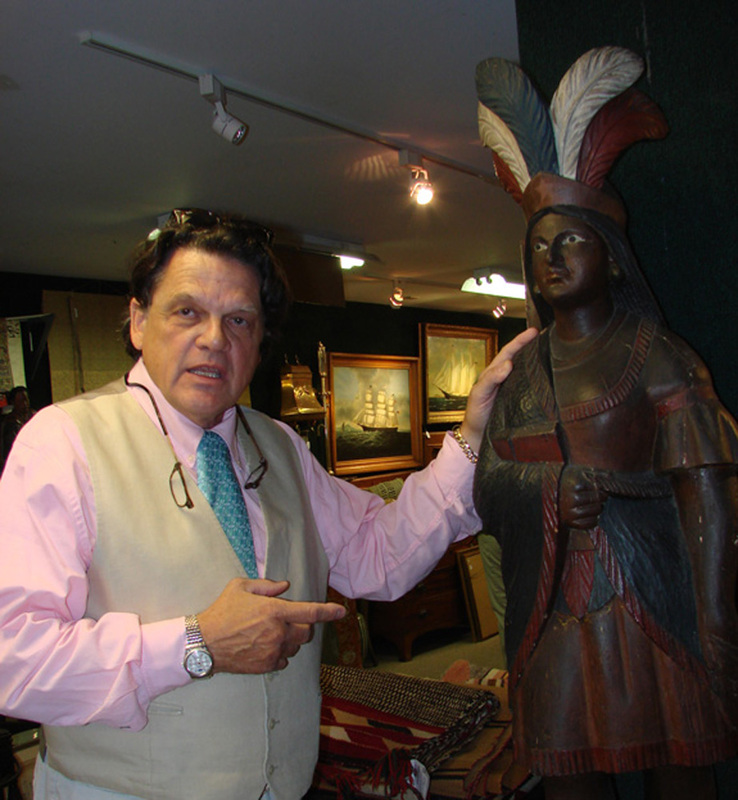 Kaja Veilleux noted that the cigar store Indian had come from a Utah estate. Wearing a five-feather bonnet, the carving was attributed to Samuel Robb (1851–1928). On her original pedestal and with little restoration or repainting, “Nickette” commanded $26,550 from an Internet buyer. She is fully identified on the back and she stands 59 inches tall. THOMASTON, MAINE — An interesting assortment of merchandise was on offer May 30–31 at Kaja Veilleux’s Thomaston Place Auction Galleries. There were many nautical items, including more than 20 fine ship models, more than 200 lots of American and European furniture, a cigar store Indian with wonderful surface, estate jewelry and ephemera. Chinese textiles and accessories did well, as did tortoiseshell boxes. The crowd just kept coming and the staff just kept bringing out more chairs. Several phone lines were in use and Internet bidding was available on three platforms. While many lots were sold to bidders in the room, online and phone bidders were often successful. The highest price of day was booked by this pair of Chinese jade plants in cloisonné jardinières. The plants were pale pink and green jade, standing 17 inches tall, on custom made teak stands. The pair brought $34,220. A strong assortment of Asian material did well, and a category highlight was the top lot of the auction. 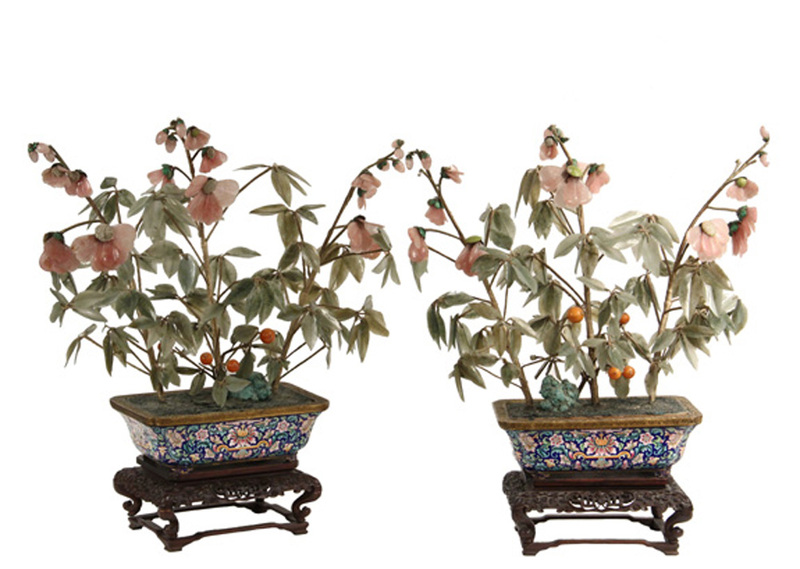 A pair of Chinese jade plants, in cloisonné pots with brass trim, 17 inches tall with their custom made stands, went to an Internet bidder for $34,220, more than ten times over estimate. Other category standouts were a Chinese lady’s robe, circa 1890, in crimson silk figured damask with embroidered decoration, interspersed with blue and white blossoms and gold bullion flaming pearls, that achieved $7,080, also going to an online bidder. A man’s Mandarin summer court robe, dating to the late Qing dynasty, circa 1900, in crimson silk satin with black trim and polychrome embroidery on the cuffs, went out at $4,720. Other Chinese garments also did well. Perhaps a bit more unusual was the lot of four Chinese cricket cages, fashioned from gourds with rosewood and/or bone caps, that made their way to $3,450. An impressive group of cased ship models and ship portraits was among the auction highlights. During the preview, they were being carefully examined by longtime marine arts dealer Justin Cobb, who does business under the trade name Captain’s Quarters. Cobb told Antiques and The Arts Weekly that several of the cased ship models were very fine, but he thought that their large size might have a negative impact on prices. Cobb said that most homes today don’t have the space for large models, or more than just one. He may have been right as some of the models seemed to be good buys. A monumental cased model of the California clipper ship, Coeur de Lion brought $2,300, under estimate. It was housed in a brass bound plexiglass case that measured 48 by 67 by 28 inches, plus its stand. Another large ship, a very detailed and well-rigged model of the Le Bonhomme Richard, sold for $3,162. The most successful of the ship models was a cased wall-mount half-hull builder’s model of the passenger steamship Aragoas. Made for a Brazilian shipping company, the model was 71 inches long. The Aragoas was used by the Brazilian Royal family; it also carried Emperor Pedro II and his family into exile in 1889. The model was made by Maurice Besgneux, French West Indies, circa 1960, and was 56 by 15 inches. It fetched $5,462. Leading the ship portraits was a portrait of the American three-mast sailing ship Merchant. The painting showed a pilot boat approaching as the ship neared the Maine coast. It was unsigned but attributed to Edward Adams (1847–1929). Adams is a well-known English artist, and apparently the bidders agreed with the attribution, as the painting earned $8,050. A portrait depicting the coastal schooner Charlotte T. Shirley passing the Boston Light also did well, going well over its high estimate. Painted by W.P. Stubbs (1842–1909), it finished at $5,175. An early Twentieth Century diving suit made $6,325. It had a bronze and copper helmet and matching breast plate, rubberized canvas suit with cuffs and leather bronze-toed boots with lead soles. Made by Siebe-Gorman, & Co. London. Good buys among ship paintings included an oil on canvas of an “American Warship Under Sail,” by Thomas Clarkson Oliver (1827–1893) that seemed like a bargain at $345. A surprise in the maritime arts category was a cast iron doorstop in the form of a whale. Made by D. Baker, New Bedford, Mass., it was 23 inches long and it went out at $3,795. Also finishing strongly was a British deep sea diving suit, circa 1905–1930, made by Siebe-Gorman & Co., London. It had a bronze and copper 12-bolt helmet, a rubberized heavy canvas suit and leather boots with bronze soles. It finished at $6,323, well over high estimate. A Pennsylvania William and Mary walnut dressing table attracted the attention of multiple phone bidders. It had a shaped X-stretcher with a finial, overhanging molded top, and probably original brass. One of the phone bidders took it for $6,325. In the “good buy” department was a Maine country Sheraton bowfront chest in good red paint, spool turned stiles, urn turned legs and probably original brasses. It went out for only $575. A transitional Eighteenth Century William and Mary/Queen Anne two-part highboy, with graduated drawers, flat molded top, and banded edge fascias, finished at $1,725. A delicate Sheraton sewing table also seemed like a good buy. It had belonged to Dr H.A. Crosby Forbes, curator of Asian arts at the Peabody Essex, and prolific author on Chinese Export arts. The bird’s-eye maple top was surrounded by mahogany banding, it was on turned legs, with bird’s-eye maple sides, and had a pull-out slide. Cataloged as being from coastal Massachusetts, it fetched $1,725. Tortoiseshell boxes and other high-quality decorative accessories had phone lines competing with one another, as well as the Internet and bidders in the room. A Regency period tortoiseshell two-chamber tea caddy, in fine condition, with a coffin-molded top and original silver trim and fittings, went online for $2,714. Two other tortoiseshell tea caddies, in slightly more restrained forms, also were sought-after, both selling in the room between $1,700 and $2,200. An exceptional Italian inlaid writing desk, made by Michele Grandvile (1823–1891) in fruitwood, Palisander, stained wood and ebonized marquetry and parquetry sold for $2,415 to a woman in the room. The same bidder also bought several English and American pieces of furniture. She asked that her name not be used but told Antiques and The Arts Weekly that buying the writing desk meant that she could not bid on the next item, a Maine Sheraton chest of drawers with bird’s-eye maple drawer fronts. She said that she needed the chest of drawers more than the writing desk, “but that I love beautiful things and the desk really appealed to me.” She was buying to furnish a 1910 house she and her husband had just bought in Friendship, Maine. The couple had moved from Miami, Fla., in favor of Maine’s clean air and the change of seasons. This was a varied auction with outstanding items in several categories, including Russian icons and antiquities and it wouldn’t be a Maine auction without some Old Town canoes. A Nineteenth Century Russian icon St Panteleimon (saint for healing sickness), with a silver oklad marked “G.K. and a wooden case finished at $4,025. An early icon fragment, dated to the Fifteenth Century, depicting Mary, Peter and Paul, earned $4,887. The small group of antiquities included an alabaster Cycladic figure which was dated circa 2600–2300 BCE. Veilleux told the crowd that a similar figure had recently sold in New York for a six-figure price. This one drew strong phone and Internet bidding, going to an Internet bidder for $20,650. The most popular of the several Old Town Canoe Company products was a 7½-inch yacht tender that earned $4,312. An Old Town salesman’s sample canoe sold over estimate, going out at $2,185. This auction literally had something for everyone. All prices reported include the buyer’s premium. For more information, call 207-354-8141 or www.thomastonauction.com.